Tim Wallach: 1987 Sportflics #115 "Tri-Stars"
Card Review: 1/3 of 4.2 I remember really liking Sportflics around the time of this card. I was about 7 or 8. They weren't easy to find, and it was always sort of a treat when my mother would take my brother and I to the card shop that sold them. Most the cards we were buying at the time were Topps from our little league snack bar, and Fleer from the grocery store. Pulling any sort of Wallach back then was cause for jump up and down celebration. But even then, I remember not really liking this card. It had more to do with the words on the back. 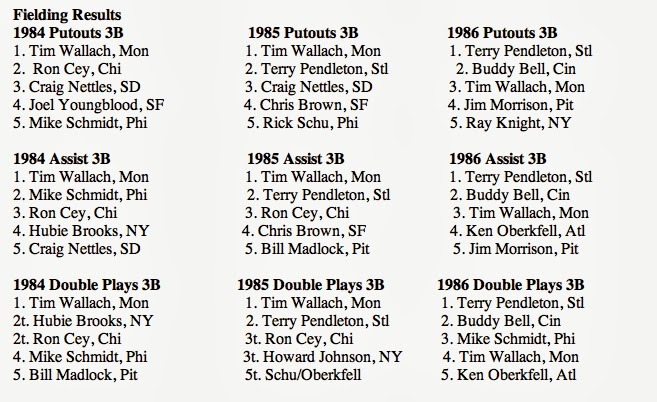 Tim Wallach had the bad luck of playing during the same time as Mike Schmidt, and in the anonymous market of Montreal. Had he had a similar career five years later as a Met or Yankee, his legacy would be much different, and I would never be able to afford to amass so many of his cards. That's just the way things work, I'm not complaining. But that does not excuse, in anyway, the back of this card. Wallach gets one sentence on the bottom, which states he; "has worked hard to make himself a solid third baseman." What? Over the previous three seasons, he'd won a gold glove, silver slugger, and been an All-Star twice. His numbers dropped a little in '86 because he stubbornly played through multiple severe injuries from spring training into August before the team finally shut him down. Sports Illustrated even did a piece on him, in which the magazine argued that Wallach had past Schmidt as the best third baseman in MLB. You probably don't recall the article, so here's a link, it was titled "An Expo in Need of Exposure." The first line of the article read; "For nearly 10 years the answer to the question, "Who is the best third baseman in the National League?" was Mike Schmidt. But last year there was a new answer, Tim Wallach, which in turn leads to some other questions. Like, "Who is Tim Wallach?" " But per sportsflics, he's just some borderline Major Leaguer that's become "solid" due to a lot of hard work. I guess the writers at Sportflics didn't get the memo. But they certainly seemed to know who Chris Brown was. It's forgivable not to remember who Chris Brown was. He played all of six seasons and only twice appeared in more than 100 games, averaging only a mere 74 games a season over that span. 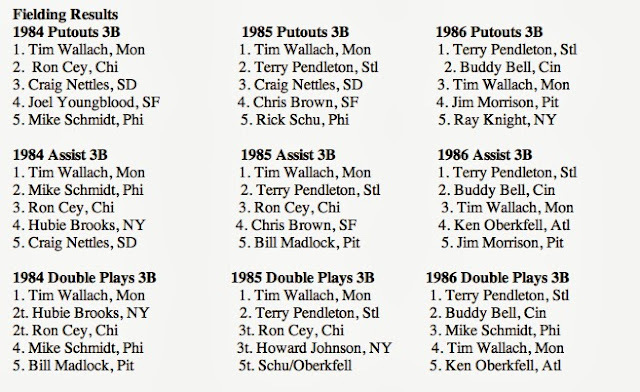 During the '86 season, in which he had all of 416 AB, 7 home runs, and finished 5th in errors while not cracking the top 5 in most positive defensive categories, he some how made the All-Star team. 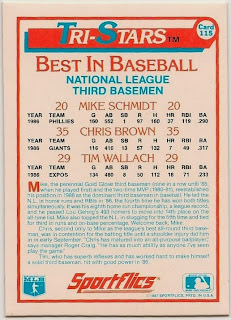 Sportflics must have been impressed (or the writer was a relative), because here's what they wrote: Chris, second only to Mike (Schmidt) as the league's best all-around third baseman, was in contention for the batting title until a shoulder injury did him in in early September. What? Ignoring the nonsense about being the 2nd best third baseman for a second (which I'll address below), I don't think "contention" means what Sportflics thinks it does. Tim Raines won the '86 Batting title, Brown would have finished a distant 10th, that is, if he had even been eligible for the batting title. Brown was 86 at-bats short of even qualifying for the batting crown. He would have had to hit .419 over those 86 at-bats to catch Raines. A tall order for a .269 career hitter like Brown. I think it's safe to assume that Sportflics wasn't talking about fielding when they described Brown as 2nd to only Schmidt among NL third basemen. So lets look at hitting. Below are the numbers of each of the players above in major offensive categories over that span. I'm excluding Bell who spent more time in the AL, and Hubie Brooks who was primarily a 2B, and including Schmidt's '85 season in which in played first base and not third. Tim Wallach would play 10 more seasons, make three more All-Star teams, win two more gold gloves, another Silver Slugger and retire with over 2,000 hits. Chris Brown would appear in 179 more games over 3 seasons and collect another 134 hits. He never made another All-Star team, or even held down a regular starting role. So clearly Sportsflics was off if they were trying to project future output. 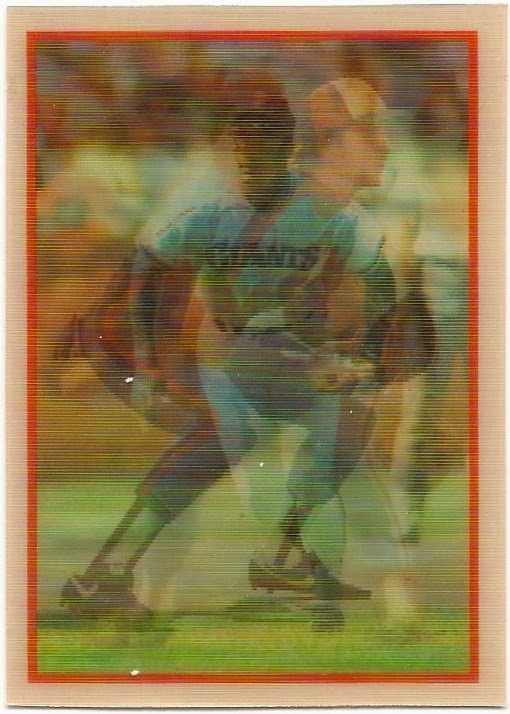 I think the conlusion is that whoever wrote the back of this card for Sportflics was a complete idiot, and/or likely related to Chris Brown. It's one of the better examples of the general lack of respect, accolade, and appreciation that Wallach received throughout his career. Not to mention what he did to poor Rhianna!